It’s that time of year again. The Christmas decorations come up just as the last bite of Halloween candy goes down. Our inbox’s are filled to the brim with Black Friday deals, Secret Santa ideas and New Year’s specials. But which ones should you purchase and for whom? Do people even give the gift of Botox? Injectables specials typically include Botox, Juvederm, Voluma, Restylane and many more. The reason for this is mostly due to the fact that they are constantly in high demand by all patients, not just surgical candidates and they also provide a little more wiggle room price wise on the back end – but you didn’t hear that from me. These specials are awesome to take advantage of if you’ve been wanting to try a certain product for the first time or if you are wanting to freshen up a previous treatment. Who doesn’t want plump lippies for Christmas, really? These seasonal deals can work in your favor if timed correctly. Doing your injectables twice a year; during the summer “back to school” promotions and the end of the year holiday promotions can really help to save some cash and keep you looking gorg all year round. Unless you are absolutely sure a procedure like this is at the top of your loved one’s Christmas list, it’s best to save these goodies to purchase as a treat for yourself and there’s nothing wrong with that! Another gift cosmetic offices love to give is a percentage off of skin care and body care. These products are awesome to give as gift sets or stocking-stuffers to the ones you care about because most cosmetic offices only carry medical-grade skin care. Medical grade skin care product ingredients are formulated in a medical grade FDA-approved laboratory. They contain potent, active ingredients that are non-diluted and are able to penetrate deep into the middle layer of the skin. They are 99.99% bacteria-free, while non-medical grade ingredients can contain up to 70% bacteria. The ingredients are of a platinum level and are not diluted with filling agents. This means a happy dance for your skin. That being said, these products are usually on the pricey side, so the holidays are a great time to stock up and also to give as gifts. Some examples of medical-grade skin care lines – Skin Ceuticals, Skin Medica and ZO Skin Care. Another great promotion to take advantage of are facials! This could be the perfect gift for a family member or friend because it is not only relaxing with an added touch of pampering, but it’s great for maintaining young and healthy skin as well. There are usually several different skin care service options to choose from so be sure to ask the experts what their recommendations are when making your purchase. Click here to see some of the skin care procedures Sunset Cosmetic Surgery Offers! Holiday discounts and promotions on actual Plastic Surgery procedures are more rare in terms of what is usually offered up to patients during the holidays. If you have been thinking about moving forward with a plastic surgery procedure and are wanting a holiday special or discount to give you that extra push, it never hurts to ask! Many offices will even do a combination or complimentary injectable with surgery or may provide some additional holiday savings when booking in the Fall/Winter months. If you or a loved one are looking to save a little on your favorite cosmetic procedures, the holidays are a great time to take advantage. There is nothing like feeling and looking your best all year round. Remember to stick with trusted providers and do your best not to chase the lowest price tag. After all, we have learned cheaper does not equal better. Enjoy your holiday beautifying and shopping! 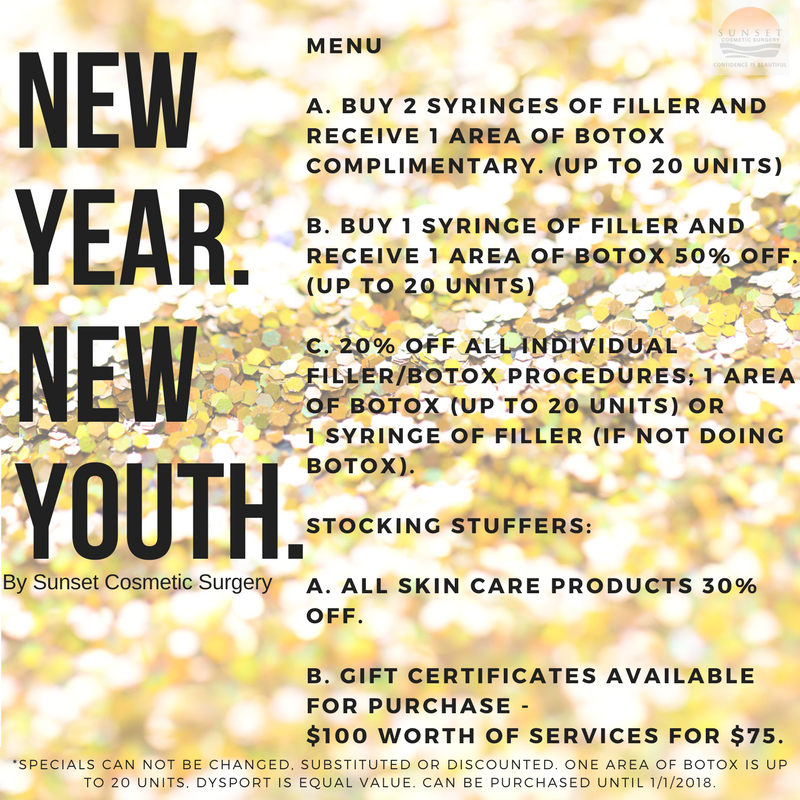 Below: Sunset Cosmetic Surgery’s – “New Year. New Youth” menu of holiday promos! Call our office to reserve your appointment – 310-858-9100.